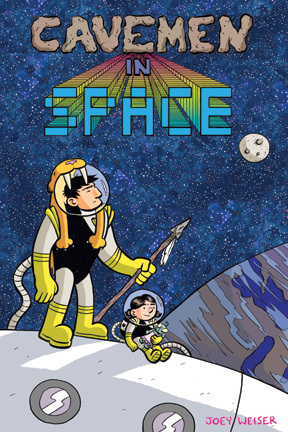 My new graphic novel, Cavemen in Space, is solicited in the March issue of the Previews catalog (to ship in May) which hit stores yesterday! It's even marked as "Certified Cool!" Go out to your local comic shop and request/recommend a copy today! A few years ago, before starting on Cavemen in Space, I did a little warm up story with all of the characters and motifs that I wanted to use. It was a good exercise and I made the story into a mini-comic. The mini has since gone out of print, so I thought that I should share the story online for all to see! The story is full-color and features all of the characters, if somewhat briefly, from the book. Enjoy! I have updated the Comics section of my website with a link, or you can read the story directly here. Remember, you have about a month to donate to the CiS Fund and to preorder the book at your local comic shop!